PARIS – Yesterday, we got so much mail on our recent issue on Donald Trump we couldn’t read it all. Pro… con… off the wall – readers’ sentiments were all over the place. As democracy is perfected, the office of the President represents, more and more closely, the inner soul of the people. On some great and glorious day, the plain folks of the land will reach their heart’s desire at last and the White House will be occupied by a downright fool and complete narcissistic moron. All over the world, elections allow the people to express their innermost thoughts and feelings. This is a big day in Argentina, for example. But when we looked yesterday, there was dispute as to exactly what time the baton would be passed. And Cristina has let it be known she would not attend the inaugural and would generally make life as difficult for Mr. Macri as possible. On the surface they are contests between zombies and cronies. The zombies (leftists, socialists, Democrats) want lots of little handouts. The cronies (rightists, Wall Streeters, Republicans) want fewer but bigger ones. All the loot comes from the voters – who willingly give up both their money and their liberty believing that, somehow, they are better off for it. But the real winner is the Deep State. It usually controls the candidates… and continues to gain power and resources, no matter which side wins. But the Deep State is not immune to setbacks. On the pampas, it must be worried that Macri may actually believe in free markets rather than markets controlled by cronies. If so, it may be harder to work with him than they had hoped. And in the U.S., poor Janet Yellen must be having trouble sleeping again. The Deep State, the zombies, the cronies – all turn their black hearts and beady eyes unto her. Next Wednesday, she takes center stage again. And with the whole world watching, she’ll make a complete fool of herself. Yellen is supposed to announce a tiny increase in the Fed’s key lending rate… currently sitting at 0.25%. Analysts will examine every word. Commentators will report, confuse, and misinterpret her remarks. And the economy and the markets will react. Each generation has its market myths. Each decides what is important and what is not. The generation of the 1970s and 1980s watched inflation rates and money supply figures. Investors had been beaten up by the inflation of the 1970s. Then they learned from Milton Friedman at the Chicago School that inflation was “always and everywhere a monetary phenomenon.” So they began to watch the Fed’s M2 money supply figures like scouts looking for early warning of an enemy attack. The attack never came. The rate of consumer price inflation fell from a high of about 15% in 1980 to its near-zero levels today. “I’m going home to the U.S. to die,” said an old friend the other day. Likewise, if investors knew what the future held, it wouldn’t happen that way. They would sell their positions before the top was in, avoiding a crash. And they’d buy before stocks hit rock bottom, never allowing a bear market to fully express itself. Surprises would be eliminated. Accidents avoided. If everyone knew where they would have a fender-bender, auto-body shops would be out of business! That is the trouble with the future: It must come as a surprise. But it’s not really possible. Because the future hasn’t happened yet. It’s just a metaphor for understanding what is going on. Farmers – at least in the old days – saved some of their corn each year as “seed corn.” This is what they would plant the following year. And if they ate it rather than saving it, they would have been “taking from the future.” Next year’s crop would be reduced as a result. More today but less tomorrow. But it is always a risk to take from tomorrow. Centuries ago, fewer seeds – and perhaps less rainfall, or too much rainfall, or too much wind, or hail, or frost – might have meant starvation. What might it mean today? We don’t know. The future is always a surprise… especially to people with PhDs in economics. And now we watch Ms. Yellen. Acres of print will be devoted to speculating on how much of an increase she will announce… and how it will be followed up. Guessing about the “pace of tightening” (that is, how soon will the first rate hike be followed by another) and positioning portfolios for tighter money – more dollars, less emerging market debt – are already growth businesses. Could it be that investors are looking in the wrong direction? 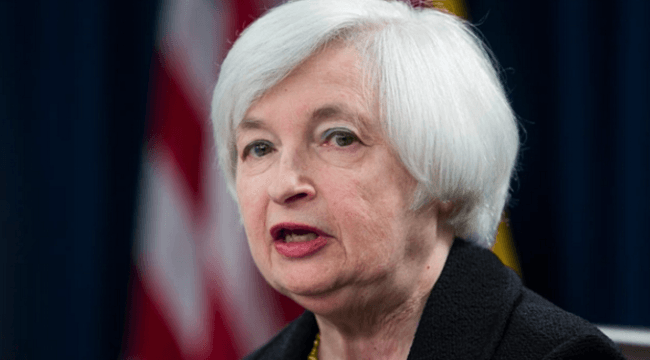 Has the future moved on… without Ms. Yellen? Have stocks already topped out? Are sales already dropping? Is subprime student, energy, auto, corporate, and emerging market debt already sinking? Have the trains already left their stations, headed to destinations that investors haven’t even thought of? Could it be that the Deep State’s debt-based financing system is already in trouble? And, after 84 months of zero interest rates and roughly $4.5 trillion of central bank stimulus, can Ms. Yellen save it? Originally posted at Bill Bonner’s Diary, right here. P.S. Bill expects a violent monetary shock, in which the dollar — the physical, paper dollar — disappears. And he believes it will be foreshadowed by something even rarer and more unexpected — the disappearance of cash dollars. Many Americans don’t see this coming because of what psychologists call “willful blindness.” But Bill has taken the extraordinary step of assembling the full shocking details in a special report. To get full details on what Bill calls the “Great American Credit Collapse”, click here right now.